Pictures in blue frames are thumbnails. Click on them to see an enlargement. To send me an e-mail click on [e-mail address] above. My First Honda CD175 "Blue"
This was my first motorcycle, actually my first motor vehicle of any kind. I did not own or even have access to a car while I had the Honda 175. I bought it new on Tuesday December 30, 1969 for $550 at Michal’s Motors, Freetown Sierra Leone. First trip was 135 miles from Freetown to Magburaka. There were 91 miles of pavement, before I got to the loose gravel and washboard. I was given a car ride to the edge of the city by the salesman and a mechanic rode my new bike in front of us. They put me on the bike and pointed me in the direction of my home. Within seconds I was up to speeds that I had never before reached on two wheels. Did I mention this was going on all on the left side of the road? On January 1st 1970 I continued from my home to Bo, 70 miles away and all gravel. I was unfamiliar with the bikes' gas range and I ran out of gas before my very first fill up. I also jammed my camera on the trip because it was not packed securely enough for the pounding on the washboard roads. The first extra purchases were sent by my mother in packages from Canada. These were items I thought I needed, but could not get at Michal’s motors. 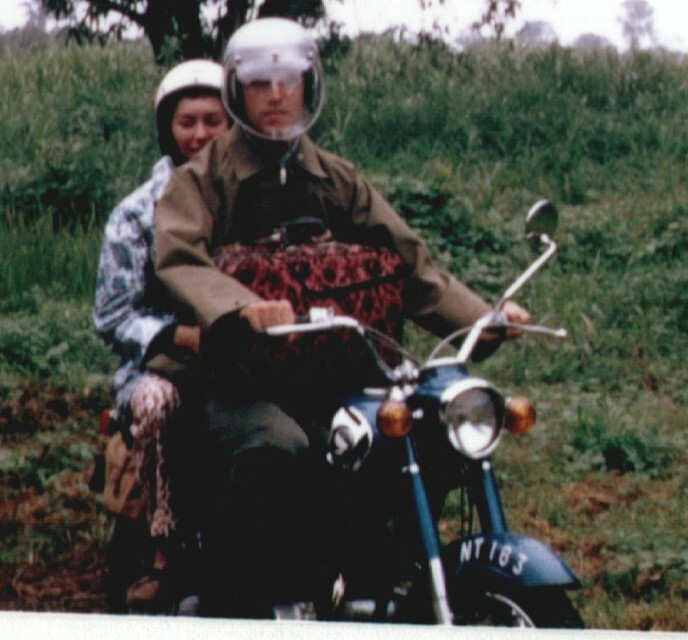 She sent a bubble shield for my helmet – I complained that there were too many rocks being thrown up by lorries. Also sent a Honda Factory (official) shop manual with the pink cover and interesting Japanese/English expressions. And a can of Simonize wax. Locally, I bought a bicycle tire pump and patch kit for flat tires, and two tire levers. On my third trip the exhaust collar nut on the left side came loose. I noticed a difference in the engine sound. I couldn't fix it on the road because at that stage of my experience, I just didn’t think there was a need for tool kits on the road. I found someone at a village with a 10 mm wrench who fixed it and burned his hand in the process. He wouldn't accept payment for his help. I don't know what to call this next incident, it wasn't exactly an accident. I was traveling at about 50 mph and hit a rock sticking out of the the road. Like an iceburg with 90% of it hidden. The back end bounced high in the air, and I went even higher. I kept the machine under control and brought it to a stop. On examining the rear tire, I saw that the rim had a serious bend in it. When I got it home, I tried to bash out the dent with a hammer. This was not too successful, until I got a heavier hammer and a steel backing. At any rate the rear rim stayed like that until I sold the bike, and it seemed to work OK. I stuck on two reflective Canadian flag decals on each side cover right under where it said ‘175’. I did this before my first trip when the bike was still at the dealer’s. Later on, I made my own rear license plate, and painted the registration numbers on the sides of the front fender by hand. I forget exactly when I did this, but you were supposed to supply your own plates in Sierra Leone. The plate the dealer gave me broke off very early. Then I bought a hacksaw and cut off the chrome grab rail located directly behind the driver’s seat. With my handy hacksaw, I cut off the flares on the fenders that I thought looked too old fashioned. On the front I decided I had cut it too short, so I created a metal extension. Today I wince at the recollection of this butchery. I went to England for the summer and got a 3.50*17 rear tire and tube, Avon. I brought it back on the plane as luggage. This was partly to cure innumerable flat tires that all happened at the rear. Then I got a knobby tire from my Honda dealer and mounted it at the front. It did not help too much in gravel, but it did mess up the handling on paved roads. When it wore out (soon enough) I went back to street tires. I had my first spill carrying a case of beer – right in front of the school where I was a teacher, of course – a sheep jumped in front of me and I locked the front brake on the gravel and went down, cracking the front turn signal, and most of the beer bottles. Trying to figure out why I had fallen, I found the rear brake was almost totally useless, and for weeks I was unknowingly stopping with only the front. I got new shoes for the rear, after I discovered that cleaning brake shoes in kerosene does not help. From that time forward, I made it a habit to use each brake alone once in a while, just as a test. I had no further crashes. Had a lot of problems with the battery, and the mufflers rusted out. The bike ran fine that way, but it was just too noisy, and I had to replace them. I lost the buddy seat somewhere out on the bush roads and never found it again. I constructed a new seat out of foam and Naugahyde mounted on a wood base. I also added a home made luggage rack made out of angle iron, and bolted it to the chrome luggage rack under the seat. This was so that I could carry a passenger and luggage at the same time. The stress was too great and the original chrome rack cracked. I took it off and made a full length extended luggage rack out of angle iron that would hold both the seat and some luggage behind. After that I began carrying the heavy stuff in a small suitcase in front of me. That setup never broke. And for some extra space, I sewed up some canvas saddlebags. I sold the bike in the spring to George Johnson who was a Liberian working in Sierra Leone for a Christian mission. It had about 14000 miles on it. I don’t remember all the details of the oil changes, but I did try to change the oil according to the owner’s manual. Also adjusted the cam chain, and timing. I even constructed a little test light to indicate when the points separated. I was never able to remove and clean the centrifugal oil "filter". When I bought this bike, I didn’t really have much of a choice. Not only was Michal’s motors the only motorcycle dealer in the country, they had only step-through Honda 90’s and two CD175’s, a red one and a blue one. Both had the buddy seat and luggage rack. The Honda 90 might have been good enough, but I was mysteriously drawn to the bigger bike. After owning the CD175 for a few years, I found certain limitations with the bike. First, the rear shocks that had no adjustment, and very little travel or dampening. It was bad enough solo, and two-up was worse especially for the passenger on the bumpy unpaved roads. Also, it got a lot of flat tires, and this was partially due to the skinny rear tire. It helped switching to a larger size. The frame flexed during cornering setting up a noticeable weaving, and the stand on the left touched down when I went a little too fast. The engine didn’t really have enough power to deal with mountain grades and a passenger. The mufflers rusted out way too fast, in about one year. Six volt electrics need all the connections to be really tight. But everything is relative. In Sierra Leone everyone admired my bike, and the most frequent conversation starter was the ‘double exhaust’ that small crowds of young men would gather to discuss. In Sierra Leone, Honda CD175’s ruled. This was the bike that started my lifelong affair with motorcycling. It also taught me about ‘do it yourself’ maintenance, and the longer I had it the more I liked it.